In China and the world, approximately 40% of the population use wheat as their main source of food. Different wheat food products, e.g., bread, noodles and biscuits, are consumed daily and worldwide. As living standards rise, consumers are paying more attention to the processing, nutritional and health-promoting attributes of major food grains including wheat. Although wheat yield level has been substantially increased over the last 50 years (since the first green revolution), improvement of wheat quality traits has not gone hand-in-hand with that of yield, likely due to the more complex nature of quality traits. Recently, a team led by Professor WANG Daowen’s at the Institute of Genetics and Developmental Biology (IGDB), Chinese Academy of Sciences, revealed that decreasing gliadin protein accumulation can improve the breadmaking and health-related trains of common wheat. This work was published in The Plant Journal (doi:10.1111/tpj.13956). The main components stored in the wheat grains are starch (65-75%) and proteins (10-15%). Although both components can be changed by breeding, manipulation of the proteins has proved critical for optimizing wheat processing (end-use) quality. This is because glutenins and gliadins, two major groups of wheat seed proteins, form a viscoelastic gluten complex during flour processing, which imparts stability, elasticity and extensibility to the dough. In general, glutenins are more potent than gliadins in shaping dough functionalities. The doughs with different degrees of stability, elasticity and extensibility are used to make different types of wheat food products. For example, bread baking requires a stable dough with stronger elasticity and extensibility, whereas biscuit processing needs the dough with lower elasticity and but higher extensibility. Apart from affecting dough properties, gliadins, which accounts for 40-50% of wheat grain proteins, are chief inducers of several types of wheat sensitivities (e.g., coeliac disease and wheat dependent, excise induced anaphylaxis) in genetically susceptible individuals. The wheat sensitive patients, estimated to be around 1-6% of the general population, are found globally. Additionally, gliadins have very little lysine, an essential amino acid for human health, in their proteins, making them nutritionally poor compared to other seed proteins that contain more lysine. Based on information gathered on gliadins, Professor WANG Daowen’s team decided to test if decreasing gliadin accumulation may be useful for simultaneously improving wheat end-use, nutritional and health-related traits. To seek for a specific and safer way of manipulating gliadin accumulation, they started a systematic mutagenetic, functional genomic and breeding study of wheat chromosomal loci encoding different types of gliadins in 2006. Common wheat, the main wheat species cultivated in the world, has six large and complex chromosomal loci carrying gliadin encoding genes. In the past 12 years, they have developed radiation-induced deletion mutants for each of the six loci in order to find the one(s) dispensable and useful in practical wheat breeding. In their recent work published in the Plant Journal, one specific gliadin locus, Gli-D2, is analyzed in detail. Structural analysis shows that the Gli-D2 region is predominantly occupied by multiple copies of gliadin genes. Functional investigations with the Gli-D2 deletion mutant, DLGliD2, discover that removal of this locus improves not only breadmaking performance (an important wheat end-use quality) but also the content of lysine in the grains. Mechanistically, Gli-D2 removal decreases gliadin accumulation, thus making more resources available for increasing the synthesis of glutenins and other proteins richer in lysine content. This enhances the stability and elasticity of dough and the overall lysine content in the grains. Deletion of Gli-D2 concomitantly lowers the toxicity of wheat to coeliac disease patients because previous studies have established that the gliadins controlled by Gli-D2 are highly potent in inducing the disease. Thus, removing Gli-D2 confers multiple benefits to wheat, improvement of end-use quality, enhancement of nutritional quality, and increase of food safety to wheat sensitive consumers. The IGDB team has also demonstrated that Gli-D2 removal does not negatively affect the growth, development and reproductive processes of wheat in diverse cultivation environments. These positive insights, plus the non-transgenic nature of the method used, suggest that the Gli-D2 deletion mutant, DLGliD2, can be used immediately in worldwide wheat quality improvement programs. The success of the research comes from many years of basic and applied research supported by the Ministry of Science and technology of China and the Chinese Academy of Sciences. Of central importance is the realization that the Gli-D2 region, although complex, carries mainly the seed expressed gliadin genes, whose deletion does not affect the overall fitness of wheat plants. This raises the questions if a similar approach may be applied to harness the remaining five gliadin chromosomal loci for wheat quality improvement, and to what extent the gliadins may be maximally removed without harming wheat growth and development. To answer these questions satisfactorily will require many more years of time. However, recent exciting developments in wheat genome editing, pioneered by another IGDB team led by Professor GAO Caixia, can speed up future studies on gliadins. Genome editing allows precise knockout and fine modifications of specific common wheat genes, which makes it possible to eradicate the bad gliadins or even to engineer the gliadins with novel functions inside the wheat genome. Clearly, future research on gliadins will continue to yield innovative ideas and resources for developing more nutritious and healthier wheat with enhanced end-use quality traits. 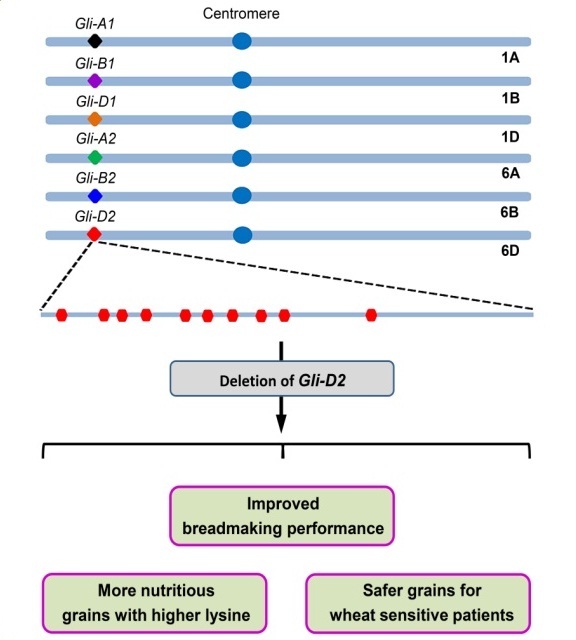 Removal of Gli-D2 from common wheat genome leads to concurrent improvement of end-use, nutritional and health related quality trains (Image by IGDB).